Illya itabag merch bundle + free Berserker - BRAND NEW, OFFICIAL keychains, acrylics, straps, badges, from Fate Stay Night, Unlimited Blade Works, Heaven's Feel, Fate Grand Order - Keychains	- Anime Market: Buy and Sell Manga, Anime and More! 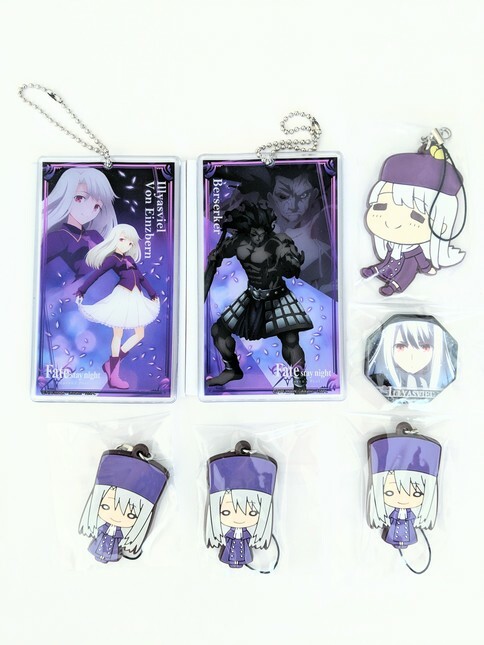 Giant bundle of 100% official merch of Illyasviel von Einzbern from Fate Stay Night (FSN), Unlimited Blade Works (UBW), Heaven's Feel (HF), Fate Grand Order (FGO), etc. You'll get everything in the first picture! Total 6 pieces, plus a FREE Berserker strap! Perfect for any itabag, shrine, or collection, or the most amazing gift for a true Illya fan! Priced to sell! This bundle is much, much cheaper than the merch is worth individually because I need the space. My loss is your gain! Smoke free and pet-free home. Final sale as-is. Open to fair offers if you can pay immediately. I'm also going to be posting a ton more anime merch so keep an eye out for my other items! Discounts for buying multiple bundles!